POLEMIC & PARADOX: HOW DO YOU STORE YOUR KETCHUP? HOW DO YOU STORE YOUR KETCHUP? The great Ketchup debate is not about the brand, but where should it be stored - on the shelf or in the fridge? At my house where an instructions nazi resides, the Ketchup is stored in the fridge. At my mom's it is kept in the cupboard. First off, I have to admit, I have never eaten out at a restaurant where they run to the fridge to get you the condiment - fresh and cool. 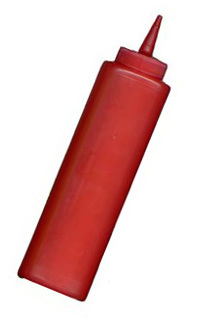 Ketchup is always in a bottle, squeezable tub or a dispenser. It is never that close to a fridge. It is loaded with sugar and vinegar making it hygroscopic. It is normally squeezed out, so there is very little cross contamination from a fork or spoon. There does not appear to be much of a foundation for life. Another thing to consider, Ketchup never lasts long. It gets gobbled up quickly. However the label does say refrigerate after opening? So, surely it must go off. It would appear to me that Ketchup is highly adverse to spoilage, but does it spoil? Of course it does, refrigerated ketchup will last longer before spoiling. Low temperature is also good to preserve great taste. If you store ketchup at room temperature it’ll lose its flavor in a matter of a couple of weeks according to doesitgobad.com. Join the great Ketchup debate! How do you store your opened bottle of ketchup? In the fridge..yuck..once something is open you have to keep it in the fridge,,,yuck! I never really thought about it! Mine is in the fridge but it is always out at restaurants. Interesting! And it is so about the brand.